What was it, and who bit the dust? When it comes to Al Capone, there are a few things most people know; that he was nicknamed 'Scarface', the he was one of the baddest men on the planet, that he was sent down for income tax evasion, and that he died while suffering the effects syphilis. If you're an American or a fan of crime history, you're also probably aware of Alphonse Gabriel's alleged involvement in a nasty piece of gang violence known as the St Valentine's Day Massacre. Chicago, 1929, and with Prohibition biting, Al Capone was less concerned with the police, who he had firmly in his pocket, than he was with a rival outfit. The North Side Irish gang was run by one George Clarence 'Bugs' Moran, the man who introduced the world to that most charming of activities, the drive-by shooting. Considered a serious threat to Capone's dominance, it had long been rumoured that 'Scarface' would move against his adversary. According to many sources, said movement occurred on the morning of 14 February. That day, North Side enforcers Peter and Frank Gussenberg were killing time at a garage on North Clark Street, together with Bugs Moran's first lieutenant Albert Kachellek, bookkeeper Adam Heyer, mechanic John May and gang associates Reinhart Schwimmer and Albert Weinshank. When the police came a-calling, none of the men were that surprised - they'd long grown used to being shaken down. So it was that the seven men thought little of it when they were asked to line up against the back wall of the garage with their faces to the bricks. It was then, however, that something utterly appalling occurred. The cops, at least two of whom were wearing service uniforms, produced a pair of Thompson submachine guns and peppered the North Siders with upwards of 70 bullets. Even when the Gussenbergs and their affiliates were clearly dead, the 'officers' continued to fire upon them, a barbaric act that left Kachellek and May so badly disfigured, they could only be identified via their dental records. As news of the attack spread across the city, speculation grew over who could possibly have organised such a massacre. Moran, who'd long been hijacking Capone's liquor supplies, assumed that his arch rival must have been responsible. "Only Al Capone kills like that," he told reporters. When asked to comment on the quote, Capone tersely replied, "Only Bugs Moran kills like that". 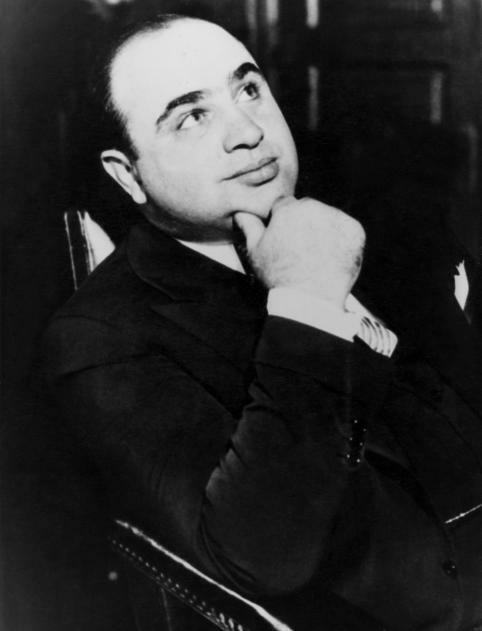 Whether or not 'Scarface' was directly involved in the killing is hard to tell, given the manner in which Chicago gangs did business with one another - authors William Helmer and Arthur Billek claim that the Egan's Rats outfit out of St. Louis might have pulled off the murders as a favour to Capone. What is known, however, is that the real target of the attack was Moran himself and that the man who carried the can for the crime, Fred 'Killer' Burke, had a history of bumping off rival mobsters. "It's gonna be a messy business." From transvestite comedy to synth dance favourites - yes, the St Valentine's Day Massacre has a hold on the popular conscience as tight as the hold Al Capone had over Chicago.